The way in which the work of this Construction Project was carried out in 1926 lies within the domain of the Senior Management. Nevertheless I believe it necessary to record the causes which gave rise to the departures noted and the timing of them, which together show a considerable disparity between the expenses of management which might be expected as reasonable for the NEW WORK carried out by the workmen. The work of railing and minor associated activities was suspended on 31 January and restarted on 10 October. In addition there was a great effort made in the contract for the engineering works from 18 January to 31 March, when work had to be suspended due to low temperatures. Work was restarted on 21 October, and continued intermittently without sufficient resources to meet the investment of funds envisaged in the contract. Thus, in the first and last months, there was a large discrepancy between the expenses actually incurred and those authorised. The work by contract and piecework was poor in the intervening months, thus increasing the discrepancy. Thus it may be said that the almost complete ceasing work resulted. I say almost, because the [direct labour] workmen, who remained on the works, undertook a multitude of small new works, apart from the maintenance of the track, and other things along the line to ease the regular passage of the trains. I will not detail figures, since the attached graphic specifies all the due investments by sections and together, limiting myself solely to review the starting points which being unchangeable were the source of the highlighted disparity. The report for the year 1925 indicated that the lack of fuel was the cause of there not being enough rolling stock to provide for the railing and other tasks to give them the impulse which they were due, but this lack [of fuel] continued for the whole of 1926, resulting in the extreme [situation] of having to suspend all ballast trains carrying material for the lifting and packing [of the track]. Even in the most recent times, the only train, with multiple difficulties due to the same cause, has carried general materials for the engineering works under construction. The authorization of the new estimate for the year just started, and with the ability now to acquire coal, makes one think of a period of time of working, which will not be enough to recover lost time. I have confidence in its effectiveness because the investment of funds will be able to form an harmonic whole between amount expended and work. There then follows a series of detailed descriptions of the work carried out at specific locations, many being for relatively minor stream diversions to reduce the number of bridges needed and for ditches, etc to drain the land where embankments will be located. Also attached are a number of views, one or two of which are reproduced below. 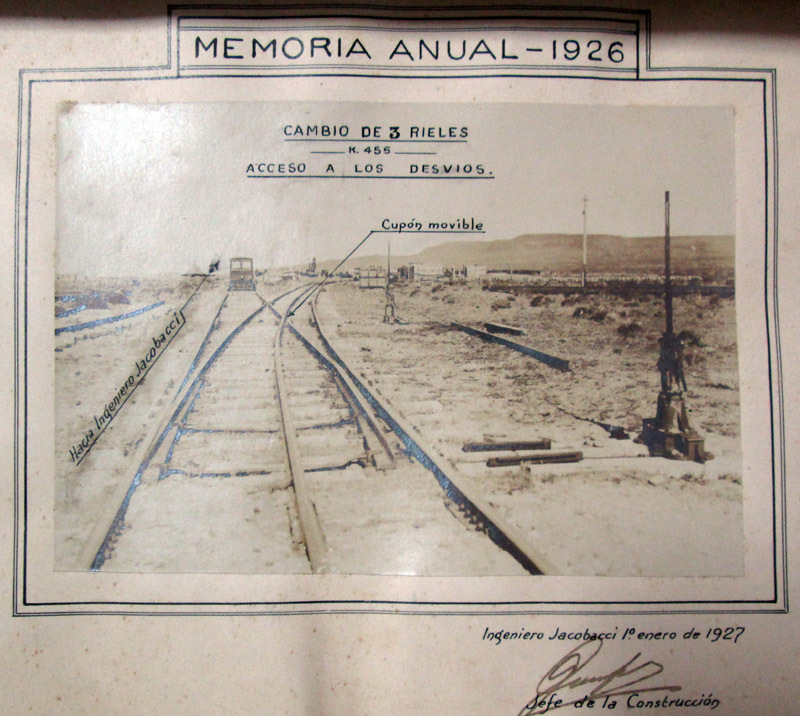 The pressure on many of the railway jobs in Patagonia was to get the rails are far advanced as possible, even if it meant quite substantial temporary works. This views shows the site of a proposed arched bridge of 12 metres span. The track is carried on massive sleeper cribs with steel service girders spanning the site of the bridge. In the foreground there is a diversion being made for a water-course alongside the road. The text of the report suggests that although the track has been laid, it still has no ballast to bring it to the required level. This view shows a culvert with an opening of 5 metres. It is built in the form of a bridge with two steel girders placed under the line of the rails. This is a common form of construction on Argentine railways. Why they chose to pose the motor trolley on the culvert is not obvious. Clearly there must be a source of suitable stone quite near, or the abutments and wing walls would have their been made of concrete. Whether the walls were made of stone or concrete, the cold of winter would have prevented construction in that season, as is noted in the report. Included in the views, but with no obvious connection to the text, is this picture of a turn out in mixed gauge track. Unlike other places where the narrow gauge leaves the broad by means of judicially planed rail ends and check rails, here moving points are used. The ramapo, not yet fitted with its indicating arrow and disc, operates not only the adjacent points but also a short length of rail (called cupón movible on the view) that swings to form the running surface of the broad gauge track or the narrow gauge track according as to how the points are set. 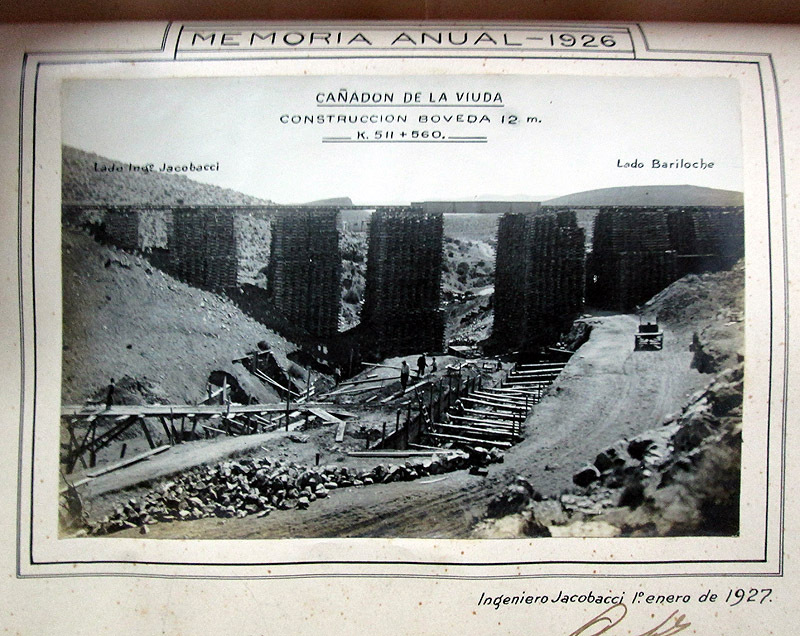 Construcción línea al Lago Nahuel Huapi, Memoria Anual, 1926 . 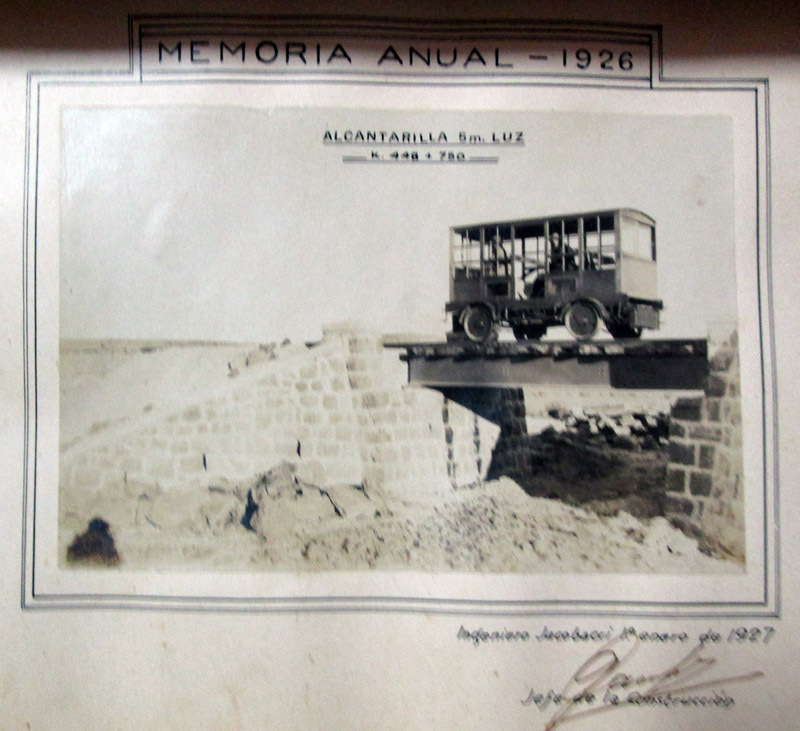 Found in the archive of Museo Nacional Ferroviario Raúl Scalabrini Ortiz, Buenos Aires.